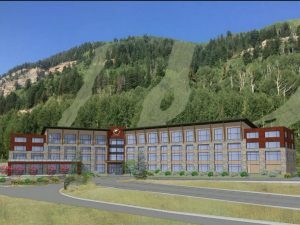 A new hotel just south of Purgatory Resort was unanimously approved Tuesday by La Plata County commissioners. The hotel is slated to be located in what is now the Gelande overflow parking lot on about 3.2 acres. Development plans show the hotel at 72,233 square feet in size with a capacity for 103 rooms. No one spoke during a public comment period Tuesday. Commissioners approved a Class 2 land-use permit and a subdivision preliminary plat. Tentatively called the Gelande Hotel and owned by Gelande Hotel Properties, a division of Mountain Capital Partners, the hotel will provide typical hotel rooms, with kitchenettes in some rooms. While there are condominiums and homes around Purgatory Resort, this will be the first stand-alone hotel at the resort, according to company officials. La Plata County planning staff found the proposed development met necessary water, sewer and access requirements and recommended to commissioners the project be approved. Gary Derck, former CEO of Purgatory Resort who is serving as development agent for the property, said the vision for developing the area around Purgatory has long been in the works. He said the hotel will feature a 3,000-square-foot ballroom, opening up the opportunity to hold large business meetings or charitable events, as well as weddings and events like family reunions. A new ski lift in the Gelande area and three additional ski trails will be added with the construction of the hotel. Also, as part of the approval process, the development will contribute more than $177,000 to be put into a fund that helps Durango Mountain Resort employees with mortgage costs. Derck said in a previous interview that if the project proceeds without delay, the hotel could open as early as 2020 or 2021.